For the past 3 months this race has been hanging over my head. 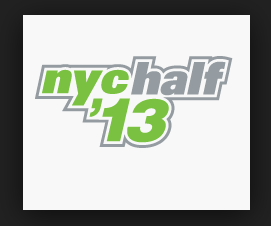 I agreed to run the NYC 1/2 Marathon for charity with a bunch of my students. I’ve made excuses for not training; I teach 20+ classes a week, I do enough cardio, I need to do yoga more than I need to run, I’m too tired…they’re endless really. Then “all of a sudden” it was last week and the race was on Sunday! I had literally run 1 (yup that’s correct, ONE) mile in the past 2 months. 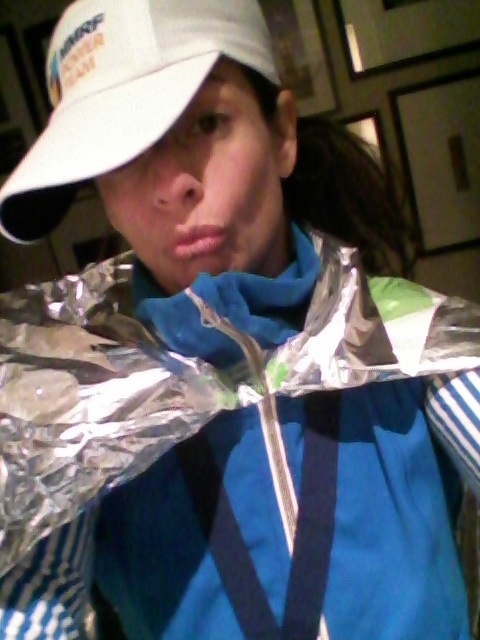 I’ve run 2 marathons and about 8 or 9 1/2 marathons. I knew I could DO the distance, but I didn’t know how painful it was going to be. What I DO love about running is that it doesn’t matter to me. I’m SUCH a competitive person that I like to be the best at everything, especially fitness wise. I like to know I can do “it” and do “it” better than most people. Running, for me is one of those things that “doesn’t count”. I know I’m not the best, I only have me to compete against and I’m not that concerned about beating me. I posted my status to Facebook yesterday pre-race “Finishing is WINNING today…Giddy UP!” That friggin’ post kept me going throughout the 13.1. The first 6 miles are the loop of Central Park. I’ve run that route countless times in my life and know how tough the hills can be. With my playlist and my level of fitness it was a breeze! I was crusin’ (or in my slow and steady kind of way) and I felt awesome. All the way through Times Square (this is a very cool race in that regard) I felt like this was gonna be a piece of cake. Dun dun dun…then came miles 8-12. My legs, quads and hammies, on both legs totally cramped up! I’ve NEVER had this happen in a race before. It was brutal. My mind was occupied with thoughts of making my way to the subway and crossing the finish line, Rosie Ruiz-style! This literally took up about 20 minutes of the run, thoughts of cheating to the end. When I got to West 11th St., which was about mile 10.5 I knew I was so close to home, but not that far from the end. I wanted to run home so badly, but thoughts of my students and my AM Facebook post kept me pushing on, I needed to “WIN”. The cramps continued until mile 12 when I think I was just so excited to be so close that I didn’t feel them anymore. We ran through a tunnel, which was kind of surreal and I found disturbing. When we emerged from the darkness there were only 800 meters to go. I kept thinking, “Just keep moving your legs. Don’t stop. I CAN, I AM, I WILL.” The latter is a mantra I use in class all the time. I know it works because it got me through this race and so to the thought that I’ve gotta do this. The shame of quitting would be too much to bare. I wouldn’t do it…and now it’s DONE! Yes, I’m proud that I ran 13.1, but I’m WAY MORE proud that I got out of bed and FINISHED the race. Yesterday, that’s what it was all about…keeping my word and finishing with pride. A GIANT congrats to my Bank of America Merrill Lynch Team who crushed it yesterday…LOVE you guys! This entry was posted in FIERCE FUN, FIERCE HEALTH, FIERCE SOUL, FIERCE WORKOUTS, FIERCE- ISH and tagged #nyc1/2marathon, committment, fitness, health, love, motivation, running, self improvement, wellness by GETFIERCE TRAINING. Bookmark the permalink.